I haven’t posted any detailed tactical articles lately. I am just finished moving house and we are still getting settled in. Now that is done I intend to launch back into writing the sequel to Patriot Dawn. However, there are about 1000 articles on the blog, which can be searched in the left side search bar, or looked up under categories on the right, or simply go through each month looking for articles of interest. In short, there is a ton of free information on this blog. If you have anything of burning interest to ask, not already covered, please feel free, and I’ll see if I can produce something. ‘Contact!’ is not an FM, which is really the point, because an FM will be of limited value to you, as will any dry regurgitation of specific military tactics. The point of the manual is to bring you a mix of training and experience applied to a collapse situation. The impetus to initially write it was to give the good honest folks the information they need to train to survive. There have been some excellent contributions on the forum lately and that is what I would like to see continue – it should not need articles from me, there are enough subject matter experts to be putting out your own articles and discussing them. If the cap fits, please step up. If your normal security measures fail, and you are taken, probably with your family, you need to fight. Hollywood conditions you to think there are some sort of fair rules when you are held under gunpoint. That may apply to some situations, but generally the longer you are a captive, the harder it is to escape. In the case of a murder-suicide you are not going to escape. There is no way out alive, therefore you just have to fight, tooth and nail. And just for the record, there is no way in hell that I would harm my family, or contemplate murder-suicide. My job is to be here to look after them. excellent. Literally my instructor just covered that in our Krav Maga class last night. We also worked on combat movement with an assault rifle. Love your book contact. Third of the way done. Plan on driving to take a couple of classes with you in the next few months. Your book has shaped all of my recent equipment purchases and mental preps as of late. Thanks! 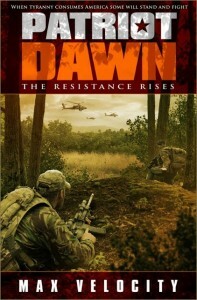 A sequel to ‘Patriot Dawn’? “Contact is not an FM” Folks be HAPPY about that. 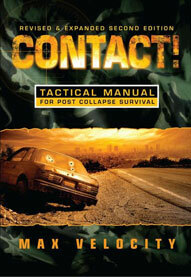 “Contact” is really easy to read, it’s not long on military abbreviations or jargon. Just enough of what you need without too much to make your head spin. Tactics and techniques presented are top notch and it’s applicable to survival groups and families, not just a dozen 18 year olds in the prime of their life. I am really amazed that the situation in question was allowed to be so easily pulled off. I mean, there are ways, (extremely inexpensive and easy ways,) to make it so that bad guys can’t just pick a lock and walk in unannounced. If you plan to be a nail that sticks up, some good security measures help to assure you aren’t easily hammered back down. There have been more ‘murder suicide’ incidents beyond the family of the Grey State director?